I am a student of New Media and Digital Culture at the University of Amsterdam with a specific interest in digital journalism, blogging and web publication. I have a B.A in European Studies from Trinity College Dublin, and my academic interests include economic sociology, gender and sexuality and history of the first World War - to name a few. As major world events unfold before our eyes at accelerated speeds, via a host of different medias how can we process these vast quantities of information? In the digital age, we consume news round-the-clock, whether we use smart phone apps, the websites of prominent news organizations, online video content, Twitter feeds or independent blogs. In times of crisis such as the Fukushima Daiichi Nuclear disaster, we have seen how digital tools have been used by millions of global citizens to document, to report and to react to a disaster in real-time. In fact, four months after the initial accident Google had returned 73,700,000 results for the search term ‘Fukushima’ and 22, 400,000 results for the search terms ‘Fukushima and radiation’. In reviewing these numbers, it is evident that people are looking for more information about the disaster – whether it be the clarification of complex radiation readings or perhaps questions about the extent of the evacuation zone. Could scarcely imagine a reality whereby access to satellite imagery would be so widely available. The second consequence lies in the capacity to understand the extent of an issue, and whether the problem is getting worse or better, or staying the same. Here I make choose the example of ASR’s Radioactive Seawater Impact Map, which uses Google Earth 3D imaging and TEPCO (Tokyo Electric Power Company) data to map radioactive water pollution over a 12 month period. Overall, the effect of content like this serves to better inform the viewer of real-time events through the interpretation of complex scientific data. 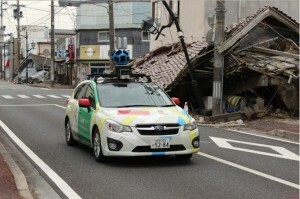 Along with Google Maps and Google Earth, through its Memories for the Future project (http://www.miraikioku.com/streetview/en/) Google has also made use of its Street View software to document areas within the evacuation zone that have been left uninhabitable by the disaster. 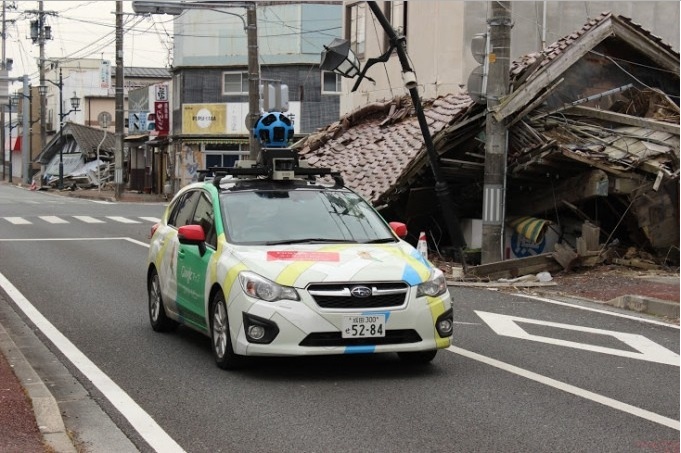 With the use of panoramic 360° cameras atop of the Google Street View cars, they have been able to capture the extent of the damage following the earthquake, tsunami and nuclear disaster and document it for generations to come. The existence of this project fuels collective memory capacity and is an excellent example of harnessing the power of geolocative technology for good. While there will always be privacy concerns regarding the use of satellite imagery, it is evident that it can be useful in generating discussion and aiding understanding at a time of mass panic. Essentially, through illustrating the world around us, we can now crowd source solutions to problems that have the potential to affect us all. Friedman, Sharon M. (2011). Three Mile Island, Chernobyl and Fukushima: An analysis of traditional and new media coverage of nuclear accidents and radiation. Bulletin of the Atomic Scientists Volume 67 Issue 5, pp. 55-65. Retrieved from http://bos.sagepub.com/content/67/5/55.full.pdf+html. Adam Clayton Powell III (1998). Satellite imagery: The Ethics of a new technology. Journal of Mass Media Ethics: Exploring Questions of Media Morality, 13:2, p. 96. Retrieved from http://dx.doi.org/10.1207/s15327728jmme1302_3. Gosling J. (2013). 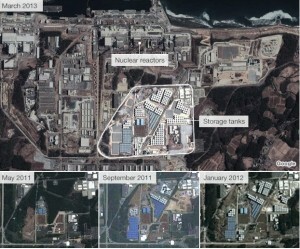 ‘Fukushima leaks: Japan pledges $470m for ‘ice wall”, BBC News, 3 Sept. Retrieved from http://www.bbc.co.uk/news/world-asia-23940214. Kawamoto, Kevin. (2003). Digital Journalism: Emerging Media and the Changing Horizons of Journalism. Lanham: Maryland, Rowman and Littlefield Publishers. Friedman, Sharon M. (2011). Three Mile Island, Chernobyl and Fukushima: An analysis of traditional and new media coverage of nuclear accidents and radiation. Bulletin of the Atomic Scientists Volume 67 Issue 5. Retrieved from http://bos.sagepub.com/content/67/5/55.full.pdf+html. Hoetzlein, Rama C. (2012). 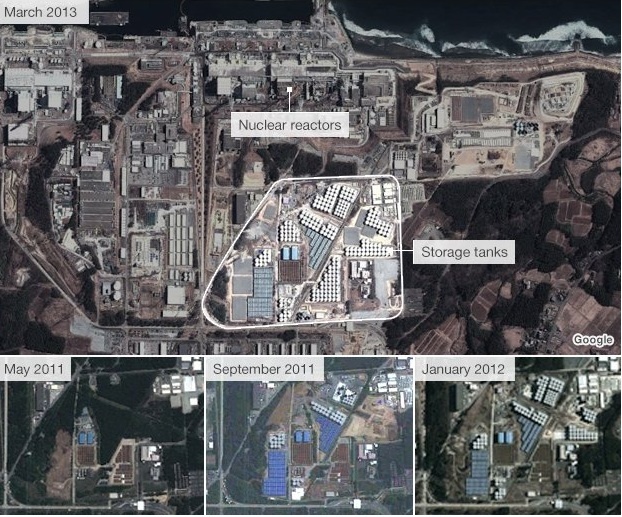 Visual Communication in Times of Crisis: The Fukushima Nuclear Accident. Leonardo, 45:2. Retrieved September 4, 2013, from Project MUSE database. Adam Clayton Powell III. (1998). 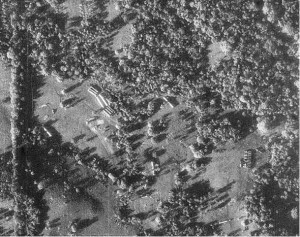 Satellite imagery: The Ethics of a new technology. Journal of Mass Media Ethics: Exploring Questions of Media Morality, 13:2. Retrieved from http://dx.doi.org/10.1207/s15327728jmme1302_3. van der Haak, B., Parks, M., & Castells, M. (2012). The Future of Journalism: Networked Journalism. International Journal Of Communication, 6, 16. Retrieved from http://ijoc.org/index.php/ijoc/article/view/1750/832.